Ecological economists currently face an important opportunity to influence national policies and global awareness regarding ecosystems. Ecosystem services (ES) frameworks, including the Intergovernmental Panel on Biodiversity and Ecosystem Services (IPBES) and the System of Environmental Economic Accounting Experimental Ecosystem Accounting (SEEA EEA) will influence how national measurement systems integrate the value of ecosystems and their services into national planning and monitoring progress towards the Sustainable Development Goals (SDGs). Decision-makers are, however, faced with an embarrassment of riches. There is a multitude of ES frameworks, but no formal and integrative evaluation of the entire set exists. We review the IPBES, the SEEA EEA and 14 other ES frameworks using criteria designed to address operational and convergence considerations for national ecosystem accounting. While the frameworks reviewed incorporate many strengths, none fulfils all the criteria of a comprehensive national ecosystem accounting framework. We conclude with suggestions for conceptual, measurement and process developments to broaden the appeal, utility and acceptance of future frameworks. Considering these suggestions could substantially contribute to the development of ecosystem accounting frameworks that foster a constructive dialogue amongst the many disciplines, national contexts and viewpoints involved in understanding, measuring and making decisions about ecosystems. During the last 15 years, a proliferation of ecosystem services (ES) and ecosystem accounting (EA) frameworks *1 (which incorporate ES within a broader scope of ecosystem and economic statistics) have been developed (see Table 1 ). While these frameworks were developed for different purposes, ranging from one-time studies to ongoing international guidance, each embeds many useful concepts and approaches that can contribute to planning and monitoring at the national level. We see national ecosystem accounting as an important opportunity for ecological economists to contribute to the development of effective and internationally accepted tools. To fully realise this opportunity, however, we should address the problem of “an embarrassment of riches”. One coherent, integrated and broadly relevant framework can serve as a starting point: a common language towards establishing a constructive dialogue amongst diverse stakeholders in national planning and leveraging this dialogue to improve the efficiency of data collection and the rigour of its analysis. The need for such a common language is emphasised by the advent of the Sustainable Development Goals ( United Nations 2015 ) in which nations agree by 2020, to incorporate the values of ecosystem and biodiversity into national planning and accounts. We do not propose national ecosystem accounting as a substitute for local and context-specific solutions, but rather as a complement to them. ES and EA frameworks embed a complex diversity of theoretical and practical considerations as well as an array of stakeholder perspectives and values. Disagreement over what should be included – for ethical reasons – over what can be included – for technical and practical reasons – and over the extent of data aggregation (summary outputs for decision-making) has remained an obstacle to the formulation of a universally and internationally-accepted language about how to mainstream nature in national decision-making. Efforts in developing and applying ES and EA frameworks are in full swing with the risk of creating more diversity than unity. We provide here a review of the state-of-the-art represented by the 16 frameworks listed in Table 1 . This paper, thus, updates and extends the foundation established by Nahlik et al. (2012) by adding four recent frameworks as well as the Millennium Ecosystem Assessment ( MA 2005 ). More importantly, we expand the evaluation lens by adding four “convergence” criteria described by Saner and Bordt (2016) . This new emphasis draws attention to improvements that would render future frameworks more defensible and more internationally acceptable. Based on the strengths of the existing frameworks and the present analysis, we suggest nine avenues for improvement that should prove beneficial to ongoing international efforts to develop national ecosystem accounting frameworks. 1.1 What constitutes ES and EA "frameworks"? include recommendations on how to engage stakeholders in setting priorities, focusing measurement activity and developing consensus on actions to be taken. A good example of a measurement framework based on a comprehensive conceptual framework is the System of National Accounts (SNA) ( United Nations Statistics Division 2008 ). Macro-economic theory establishes the concepts of consumption, investment, government spending, imports and exports to derive national economic production. The SNA provides classifications and methods to guide the measurement of these concepts with the aim of deriving, amongst other aggregates, Gross Domestic Product (GDP). Although GDP is one aggregate indicator, the SNA is built upon a rich set of detailed economic data that are used to analyse a variety of issues. Measurement frameworks may also arise from case experience without the benefit of a conceptual framework. Indicator frameworks, such as the UN Framework for the Development of Environment Statistics (FDES) ( United Nations Statistics Division 2013a ), have arisen from the pragmatic need for indicators that address specific policy concerns, such as limiting one pollutant or protecting one type of ecosystem. These often lack coherent conceptual grounding and therefore lead to difficulties in applying them to integrated decision contexts such as sustainable development, climate change and green growth. EA, as embodied in the SEEA EEA ( United Nations et al. 2014 ), is a measurement framework that integrates current ecological, economic and statistical concepts to guide the collection and classification of data and the production of standard accounts (coherent, structured statistics), integrated output summary statistics and maps. As with the SNA, the intent is to provide aggregate statistics, but also to maintain the richness of detail required for more local and context-specific analyses. The SEEA EEA is considered “experimental”, since several conceptual and measurement issues remain to be resolved. The first step to resolving these has been a series of national pilot studies, the results of which have contributed to a set of Technical Recommendations ( United Nations Statistics Division 2017 ), which augment the original document. This paper reviews conceptual, measurement and process frameworks to gain insights into opportunities for the further development of national ecosystem accounting. The main selection criterion is that the framework provides a broad and detailed scope on how to conceptualise and measure ecosystems and their contribution to well-being, whether narrowly in economic terms or more broadly. ES models are not reviewed although some constitute quite comprehensive approaches to measuring and mapping ES. Assessments of integrated ES models ( Bagstad et al. 2013, United Nations Statistics Division 2013b, United Nations Statistics Division 2015b ) suggest that no existing model is sufficiently comprehensive, coherent and transparent to support the statistical requirements of EA. Nahlik et al. (2012) evaluated eleven peer-reviewed ES frameworks ( Table 1 ) selected for their operationalization potential, number of citations and interdisciplinarity. We review these frameworks and add three international frameworks: the MA (2005) , the IPBES-CF ( Díaz et al. 2015 ), the UN SEEA EEA ( United Nations et al. 2014 ). Two additional peer-reviewed frameworks ( Chan et al. 2012, Kandziora et al. 2012 ) are also reviewed since they address vital issues that are not well covered by the others. Our review excludes two international platforms that may be considered in scope: TEEB ( Ring et al. 2010 ) and the World Bank WAVES programme ( Lange 2014 ). Both accept the SEEA as a supporting measurement framework ( TEEB 2013 ) and therefore share many basic concepts with the SEEA. TEEB focuses on framing new national policies to consider priority ES. WAVES is a global partnership promoting the inclusion of natural capital in national accounting. The TEEB, WAVES and SEEA communities of practice overlap and coordinate closely. These are listed below first as 3.1-3.6. The 16 papers are reviewed for whether they address these criteria in a way that can be easily implemented in international guidelines for national ecosystem accounting. The authors first noted how each paper addressed each criterion *2 , developed a consensus on this assessment, then summarised it into three categories (fully, moderately or not addressed) ( Fig. 1 ). To fully address a criterion, a concept would need to be well-defined and sufficiently detailed to support guidance on measurement and implementation. This required judgement and it is likely that other reviewers could have different assessments. Summary of review of 16 ecosystem services frameworks applying 10 criteria. Additional technical criteria would facilitate comparing specific implementations of frameworks ( Bordt 2015b ). However, pragmatism suggests that issues of convergence and operationalization be addressed early in establishing measurement priorities. Once stakeholders have agreed on the strategic approach, issues of technical implementation can be better resolved. Nahlik et al. (2012) suggest that ES frameworks can only be operationalized if they include a clear definition and a systematic, complete, non-duplicative and consistent classification system for ecosystem services. Sub-criterion 1a: The classification of ecosystem services (provisioning, regulating, cultural and supporting) developed for the MA (2005) is still extensively applied. However, two classification systems have since been developed that are more consistent with the Boyd and Banzhaf (2007) concept of final ES (“components of nature, directly enjoyed, consumed or used to yield human well-being”) ( Boyd and Banzhaf 2007 , p. 619). The Final Ecosystem Goods and Services Classication System (FEGS-CS) has been applied in the US ( Landers and Nahlik 2013 ). The Common International Classification of Ecosystem Services ( CICES 2013 ) has been embedded in ecosystem assessment work in Europe ( Maes et al. 2016 ), as well as in the SEEA EEA. We add to this criterion the need for explicit classifications of ecosystems and ecosystem processes. Sub-criterion 1b: An explicit and precise classification of ecosystems is essential to national ecosystem accounting as a means of integrating information and avoiding gaps and overlaps. Linking measures of ES to spatial areas that produce them inform place-based actions such as protection and restoration. Sub-criterion 1c: Predicting future ES requires understanding how ecosystems produce services. Ecosystem processes *3 are often included in ES classifications in terms of supporting, regulating or intermediate ES ( MA 2005, CICES 2013 ). A clear definition and classification of ecosystem processes would support measuring this essential link between ecosystem structure, condition and final ES. Sub-criterion 2a: Transdisciplinarity, in terms of the disciplines engaged in framework development (natural sciences, social sciences and non-scientists) and the capacity of the concepts and language to transcend disciplines, is essential for operationalization ( Nahlik et al. 2012 ). Sub-criterion 2b: We apply this criterion more broadly, since for a framework to foster convergence, it must also be comprehensible to a range of stakeholders including civil society, policy-makers and national statisticians. This may be reflected in implementation processes, the language used or in aggregate outputs used to communicate results. Sub-criterion 3a: There are two leading perspectives on how frameworks are developed and this influences how we consider community engagement. Ash et al. (2010) proposed that developing a conceptual framework be the first stage of study design. That is, each study engages in political deliberation to decide what affects what and how to measure it. This approach, while promoting convergence of viewpoints within studies, hinders convergence across different studies and scales. In contrast, the international statistical community develops frameworks in collaboration with national experts and international organisations ( Bordt and Rastan 2015 ). Frameworks, thus developed, are then adapted to national contexts, allowing for differing capacities, priorities and data availabilities. Sub-criterion 3b: We augment Nahlik et al's criterion for community engagement *4 to focus as well on the approach to implementation. That is, how is stakeholder engagement treated in priority setting, assessment and decision-making? Assessing adaptability of a framework to new knowledge and changes in social values, however important, is challenging. Longevity is determined by both efficacy and path dependence. That is, a new framework may be “better” than preceding ones, but adaptation across diverse communities may be limited if users are entrenched in previous approaches. Sub-criterion 4a: Conceptual and process frameworks are inherently more “resilient” (and transdisciplinary, cohesive, coherent and comprehensive) than measurement frameworks, since they generally focus on high-level principles rather than specific data requirements. However, measurement frameworks can be adaptable if they provide guidance on alternative approaches or data sources to achieve the same results. Sub-criterion 4b: We also gauge the resilience of a framework in terms of the degree of testing and academic, national and international commitment. Given a high degree of commitment, comprehensive measurement frameworks, like the SNA, can be adapted to evolving knowledge, concepts and social preferences. Sub-criterion 5a: Frameworks are reviewed in terms of soundness of core concepts and explicitness of assumptions about how they relate to accomplish the stated objective. We add to this two sub-criteria for comprehensiveness. That is, beyond classifications of ES, guidance is provided on what to measure and how. Sub-criterion 5b: To be comprehensive, guidance would need to be given on classifying the components of the ES cascade ( Haines-Young and Potschin 2010 ), thereby linking measures of ecosystem structure, processes, ES and contributions to well-being. Sub-criterion 5c: In addition, to be comprehensive, guidance would need to be given on measuring all components of the ES cascade. There is increasing demand for information that supports decisions on optimal management of ecosystems at all scales and in all contexts ( Vardon et al. 2016 ). The SDGs, for example, include many targets that are directly related to managing ecosystems and ES. At the national level, countries embed ecosystems and ES into national development plans and biodiversity strategies with the intention of maintaining long-term benefits and protecting natural heritage. Sub-criteria 6a and 6b: To be relevant to ecological, economic and social decision contexts, a framework would explicitly support ongoing monitoring and reporting on national goals (6a) and inform trade-offs between conservation and development with standard aggregate results (6b). That is, if outputs are coherent with established decision processes, they are better placed to inform stakeholders of the consequences of decisions. Sub-criterion 6c: A framework that provides guidance on producing a “dashboard” of key indicators, graphs and maps, would facilitate an understanding of trade-offs rather than forcing a single aggregate of incommensurable indicators. Criterion 7: To foster convergence amongst divergent ethical positions, Saner and Bordt (2016) highlighted the need for defining and identifying CNC: ecosystems, species or processes that are ecologically, socially or economically important and are considered threatened ( Brand 2009, de Groot et al. 2003, Rounsevell et al. 2010 ). These could include locally significant cultural landscapes or essential global processes, such as carbon sequestration. Including a definition and process for identifying CNC would accommodate the ethical position that nature exists for purposes beyond its service to humans and therefore cannot be substituted for other forms of capital. Criterion 8: Consideration of future implications of current actions is integral to making decisions on the optimal management of ecosystems. There are two main approaches for incorporating long time-frames. The first is applying quantitative ecological functional relationships, as is done in models that forecast future ES based on assumptions of changes in condition ( Bagstad et al. 2013, United Nations Statistics Division 2013b, United Nations Statistics Division 2015b ). The other is through qualitative scenario approaches that consider a range of technological optimism and alternative world views of future resource constraints ( Carpenter et al. 2006, Costanza 2000 ). If we are to manage ecosystems in keeping with diverse ethical values, a broad range of human values should be incorporated. Sub-criterion 9a: The instrumental benefits of ecosystems to economic production and human welfare (economic production, poverty alleviation, employment, equity) are core to many ES frameworks. Following arguments put forward by Norton et al. (1997) , we argue elsewhere ( Saner and Bordt 2016 ) that explicit treatment of two further “intellectual” values are required to secure broad buy-in from stakeholders. Sub-criterion 9b: “Existence value” considers the importance of nature beyond its immediate economic benefits. If humans value a species or an ecosystem for its intrinsic (inherent) or relational (embodied in the relationship of the individual or collective with nature) ( Chan et al. 2016 ) value, then they are willing to give up scarce resources to support a policy that protects it ( Attfield 1998 , Norton et al. 1997 ). Sub-criterion 9c: “Transformative value” is the capacity of nature to change our “preferences in accord with a higher ideal” ( Afeissa 2008 , Norton et al. 1997 ). These are sometimes expressed in terms of spiritual or aesthetic values. We divide “Precaution” into three distinct uncertainty concepts: statistical uncertainty, uncertainty of current knowledge and uncertainty about the future. Sub-criterion 10a: Incorporating the treatment and presentation of cumulative statistical uncertainty in measurement and prediction informs users of the “fitness for use” of the results. Sub-criterion 10b: Acknowledging a possible lack of consensus over the state of current knowledge and prediction provides greater transparency to decision-makers. It can also focus research on resolving these issues of divergence. Sub-criterion 10c : Qualitative scenario approaches address uncertainty by couching decisions within a range of possible futures. The frameworks reviewed incorporate varying degrees of conceptual, measurement and process orientation. Since most have been developed for other purposes, the review seeks to draw out their strengths that could be applied to national ecosystem accounting. The intent is not to choose a “winner”, but to suggest avenues for the development of future national ecosystem accounting frameworks. Results of the review are summaried in Fig. 1 . Details are provided in Suppl. material 1 . Several approaches ( de Groot et al. 2003, Hein et al. 2006, Kandziora et al. 2012, MA 2005, Maynard et al. 2010 ) suggest explicit classifications of ES. While the MA (2005) acknowledges overlaps in its classification (provisioning, regulating, supporting and cultural), subsequent efforts have sought to minimise double counting by focusing on final ES. The classification developed by Kandziora et al. (2012) , selected from the MA and CICES, further includes abiotic services (minerals and energy). The first version of the SEEA EEA ( United Nations et al. 2014 ) adopted the CICES, while acknowledging ambiguities in its measurement boundaries — that is, precise definitions of what is being classified. Developing an international standard classification of ecosystem services remains on the SEEA EEA research agenda ( United Nations Statistics Division 2017 ). Chan et al. (2012) expanded and systematised the notion of cultural ES. The MA, Maynard et al. and the SEEA EEA included specific and comprehensive ecosystem classifications. The MA applied 10 overlapping ecosystem types (“reporting categories”). The SEEA EEA classification described 16 land cover/ecosystem functional unit categories with no further detail. This is also an ongoing area of research in the further development of the SEEA EEA ( United Nations Statistics Division 2015b ). Maynard et al. applied a region-specific classification describing 32 categories consistent with the MA. IPBES (2018) also suggested terrestrial and aquatic units of analysis, but no explicit definitions. Three papers reviewed ( de Groot et al. 2003, Hein et al. 2006, Kandziora et al. 2012, MA 2005, Maynard et al. 2010 ) assess linkages between specific ecosystem processes and ES. Wainger and Mazzotta (2011) highlighted the responses of ecosystem processes to human actions. The SEEA EEA included some ecosystem processes (such as primary productivity and vegetation growth) in measures of condition. Several others embed ecosystem processes in “supporting” or “intermediate” ES ( Fisher et al. 2009, Hein et al. 2006, MA 2005, Paetzold et al. 2010 ). The frameworks reviewed, by and large, demonstrate conceptual transdisciplinarity in their development by integrating physical sciences and economic concepts (although three of the frameworks were comparatively “disciplinary” on this criterion, see Fig. 1 . Transdisciplinarity in implementation is demonstrated by integrating social science concepts such as deliberative stakeholder and adaptive management approaches ( Chan et al. 2012, Cowling et al. 2008, Díaz et al. 2015, Fisher et al. 2009, Maynard et al. 2010 ), developing user-friendly aggregates ( Hein et al. 2006, United Nations et al. 2014 ) or both ( Daily et al. 2009, Paetzold et al. 2010, Rounsevell et al. 2010, Wainger and Mazzotta 2011 ). Only Maynard et al. (2010) and Chan et al. (2012) emphasised the role of stakeholders in framework development ( Table 2 ). These and others suggest engaging stakeholders in the priority setting and assessment stages of implementation ( Cowling et al. 2008, Daily et al. 2009, Paetzold et al. 2010, Turner and Daily 2008 ). Four frameworks explicitly engage stakeholders in decision-making as well ( Chan et al. 2012, Cowling et al. 2008, MA 2005 ). Addressing community engagement in framework development and implementation. A check mark (✓) indicates that community engagement is addressed. Most of the frameworks reviewed embody ecological and economic concepts that are adaptable to many contexts. In that respect, their resilience is limited only by their ability to integrate new knowledge and to motivate academic and institutional commitment. Early frameworks ( Daily et al. 2009, de Groot et al. 2002, Fisher et al. 2009, MA 2005, Hein et al. 2006 ) established conceptual foundations for later ones and are therefore frequently cited in literature. However, other than the MA, which inspired numerous studies, including TEEB and the UK National Ecosystem Assessment ( UK DEFRA 2011 ), rigorous testing of these frameworks is not evident in literature. SEEA EEA and IPBES-CF have substantial international agency commitment. However, neither has yet been fully implemented, so their feasibility in national contexts remains to be proven. As with resilience, the conceptual coherence of most frameworks reviewed is evident in their focus on broad ecological and economic concepts. However, fewer are comprehensive in terms of coverage of the breadth of the ES cascade and guidance on measurement. The evolution of ES frameworks shows the advances in coherence and comprehensiveness over time. Early frameworks ( de Groot et al. 2002, MA 2005 ) conceptualise many aspects of the ES cascade, whereas subsequent ones provide additional detail on specific components ( Kremen and Ostfeld 2005 ), recognise the importance of spatial scale and institutional setting ( Hein et al. 2006 ) and economic valuation, decision context and stakeholder participation ( Cowling et al. 2008, Daily et al. 2009, Paetzold et al. 2010, Turner and Daily 2008 ). Recent frameworks have built on these to integrate a more systematic view of the ES cascade ( Díaz et al. 2015, Kandziora et al. 2012, Maynard et al. 2010, Rounsevell et al. 2010, United Nations et al. 2014, Wainger and Mazzotta 2011 ). Measurement issues are addressed in terms of specific output indicators such as an Ecosystem Services Profile ( Paetzold et al. 2010 ) or an Ecoservice Production Function ( Wainger and Mazzotta 2011 ), guidance on measuring cultural values ( Chan et al. 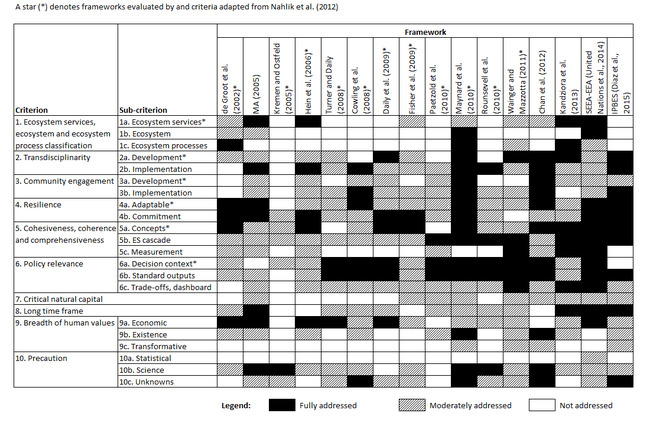 2012 ) or, more comprehensively, in terms of indicators and linkages between components ( Kandziora et al. 2012 ) and accounts ( United Nations et al. 2014 ). Although all frameworks reviewed are intended to influence policy, many do so by focusing largely on improving evidence. A few go beyond this to acknowledge the need for incorporating this evidence into integrated social, economic and environmental decision processes. Daily et al. (2009) advocated mainstreaming ES values through financial mechanisms. Chan et al. (2012) established a deliberative process for integrating local stakeholders and their cultural values into local decisions. Maynard et al. (2010) engaged stakeholders in the framework development and assessment process. Rounsevell et al. (2010) addressed the impacts of policy responses on ES provision. Hein et al. (2006) underscored the importance of the geographic scale of institutions making decisions. As noted in Section 4.3 and Table 2 , two frameworks ( Chan et al. 2012, Maynard et al. 2010 ) explicitly included decision-makers in framework development, while six others included them only in implementation. Most papers reviewed include economic aggregates of ES values as one of their outputs. Fisher et al. (2009) suggested that different decision contexts (understanding and education; cost-benefit analysis as an aid to environmental decision-making; landscape management; public policy and equity in human welfare; and meeting multiple objectives) and stages of assessment require different classifications and aggregates. Paetzold et al. (2010) and Wainger and Mazzotta (2011) developed innovative holistic aggregate indicators. The SEEA EEA ( United Nations et al. 2014 ) envisaged using monetary ES values to adjust standard macro-economic aggregates such as degradation-adjusted economic production. Several authors venture beyond single aggregates and suggest dashboards to communicate incommensurable indicators ( Kandziora et al. 2012, United Nations et al. 2014, Wainger and Mazzotta 2011 ) or decision processes that take multiple objectives, scales or values into account ( Cowling et al. 2008, Díaz et al. 2015, Fisher et al. 2009, Hein et al. 2006, MA 2005, Rounsevell et al. 2010 ). CNC is not explicit in any framework reviewed. It is however, implicit in many; largely with respect to ecological criticality in terms of (a) thresholds ( Rounsevell et al. 2010, Wainger and Mazzotta 2011 , (b) sustainable use ( de Groot et al. 2002, MA 2005, Paetzold et al. 2010 ), (c) the importance of ES to well-being ( Fisher et al. 2009, Kandziora et al. 2012 ) or (d) mapping spatial areas contributing most to ES production ( Maynard et al. 2010 ). Two frameworks ( Chan et al. 2012, Díaz et al. 2015 ) suggest deliberative stakeholder processes that would allow for the designation of "non-substitutable" CNC. A long time-frame is embedded in most frameworks reviewed, if only out of concern for the future flow of services rooted in the concepts of regulating ES ( Fisher et al. 2009, Hein et al. 2006, Maynard et al. 2010 ) and ecological integrity ( de Groot et al. 2002, Kandziora et al. 2012, Kremen and Ostfeld 2005, Rounsevell et al. 2010 ). Quantitative projections and qualitative scenarios are integral to the MA (2005) and IPBES-CF ( Díaz et al. 2015 ). This reflects the many expert collaborators engaged to address this level of complexity. The SEEA EEA ( United Nations et al. 2014 ) proposed projections of future ES flows to estimate the net present value of ecosystem assets. Others ( Cowling et al. 2008, Daily et al. 2009, Paetzold et al. 2010, Wainger and Mazzotta 2011 ) acknowledged the need for qualitative scenarios to inform policy options. The economic value of ES is addressed in most frameworks reviewed. The SEEA EEA ( United Nations et al. 2014 ) further envisaged full integration of ES values into economic production functions — that is, accounting for the contribution of ecosystems to the currently-measured factors of production (capital, labour, energy, materials and services). This, however, does not address the contribution of ES to ecological or social production functions (ecological integrity and long-term well-being). Several authors ( Chan et al. 2012, de Groot et al. 2002, Díaz et al. 2015, Fisher et al. 2009, Hein et al. 2006, Kandziora et al. 2012, Maynard et al. 2010 ) argued that ES valuation must also include ecological and socio-cultural values that cannot be expressed in monetary terms, but none systematically addressed measuring existence or transformative values. The MA (2005) conceptually links ES with components of well-being, which include “freedom of choice and action”. The linkage between ES and well-being is addressed more systematically by Kandziora et al. (2012) , however, their category of “subjective well-being” does not include existence or transformative values. Maynard et al. (2010) expanded “freedom of choice and action” to include “self-actualization”, but did not link this to ES. Only Chan et al. (2012) and IPBES-CF ( Díaz et al. 2015 ) suggested breaching the concept of “nature as a service” by explicitly incorporating non-instrumental values into decisions. Chan et al. (2012) suggested that, since monetary valuation of spiritual and heritage values, cultural identity and social cohesion is futile, these values are invisible in decisions. IPBES-CF ( Díaz et al. 2015 ) suggests that “good quality of life” include the instrumental well-being alongside “living-well in balance and harmony with Mother Earth”. Determining and communicating statistical uncertainty is not addressed in any framework reviewed. The MA endeavoured to state the degree of the team’s confidence in its conclusions ( Carpenter et al. 2009 ). The SEEA EEA acknowledges that biophysical flows of ES, other than provisioning services, are not consistently or frequently measured and therefore statistically uncertain. Most frameworks do recognise the uncertainty of the underlying science and suggest future testing and research. Some acknowledge that scientific evidence is only one input into decisions that also must take into account subjective social preferences ( Chan et al. 2016, Cowling et al. 2008, Fisher et al. 2009, Maynard et al. 2010, Wainger and Mazzotta 2011 ). Others ( Díaz et al. 2015, Kandziora et al. 2012, MA 2005 ) relied on expert consensus to resolve issues of scientific uncertainty. Rounsevell et al. (2010) further suggested deliberation to identify gaps in knowledge to be addressed in successive iterations. Unknowns about the future are treated in the MA (2005) using qualitative deliberative approaches in combination with quantitative methods (trends and models) to guide the development of scenarios of future implications of current decisions. This approach has also been proposed for local ( Chan et al. 2012, Rounsevell et al. 2010, Turner and Daily 2008, Wainger and Mazzotta 2011 ) and forthcoming global assessments ( Díaz et al. 2015 ). We observe a trend over time (from left to right in Fig. 1 ) towards greater completeness. None of the frameworks, however, fully addressed all the criteria set forth for a comprehensive national ecosystem accounting framework ( Fig. 1 ). Some criteria are fully addressed by many frameworks: Criteria 2 (transdisciplinarity), 4 (resilience), 5a and 5b (concepts and ES cascade) and 6 (policy relevance). In contrast, few frameworks fully address Criteria 1b (classifying ecosystems), 5c (guiding measurement), 7 (designating CNC), 9b and 9c (embedding existence and transformative values) or 10a (treating precaution with respect to statistical uncertainty). Based on this analysis of the 16 frameworks and our in-depth work on Criteria 7 to 10 ( Saner and Bordt 2016 ), we make the following nine modest suggestions. Each suggestion focuses on one or more gaps in current approaches in addressing these criteria. The suggestions are intended for the international ecosystem accounting community to conduct additional work on conceptual, measurement and process development. The suggestions for conceptual development focus on further systematising the concepts and classifications of the components of the ES cascade, thus ensuring the consideration of a breadth of human values (Criteria 9b and 9c) and guidance on what to measure (Criteria 1b, 1c and 5c). Measurement development would benefit from the more stable knowledge platform provided by progress on conceptual development. These suggestions focus on producing measures that are more coherent with that knowledge (Criteria 5c and 8), statistical practices (Criterion 10a) and aggregate outputs (Criteria 6b and 6c). The suggestions for process development focus on embedding ES frameworks within processes of development and implementation that recognise policy needs (Criteria 3b, 4b, 10b and 10c), including the designation of CNC (Criterion 7) to improve opportunities for applying them to making better decisions. Making progress on these suggestions would foster convergence to ensure that future ES frameworks are more operational and comprehensive. It is not the intention of this review that all suggestions be incorporated into a single unified framework; one avenue for future development could be to build stronger and more explicit linkages between frameworks. The additional “convergence” criteria, however, are shown to expand the range of principles to guide development for purpose-based applications. One such application — national ecosystem accounting — would benefit from convergence between and within communities of practice to further focus ongoing measurement, monitoring and reporting of ecosystems and their contributions to well-being. Suggestion 1: A systematic, globally-accepted classification of well-being that includes the contribution of nature would improve the inclusion of diverse perspectives (Criteria 9b and 9c). Most, if not all, decisions are intended to affect the well-being of humans. To conceive of a comprehensive classification of well-being that considers the contributions of ecosystems would be a challenge since the object of decisions ranges from individual to global, the time frame ranges from immediate to long-term and there is a multitude of contexts. While acknowledging that countries and cultures have their own definitions of well-being, we suggest that international guidance would support clearly acknowledging the contributions of ecosystems. Many ES frameworks already describe elements of well-being. Kandziora et al. (2012) linked these elements systematically to ES, but they did not explicitly treat non-instrumental values, such as existence and transformative values. Maynard et al. (2015) also applied their participatory approach to assessing the contribution of ecosystems to community well-being. The OECD (2011) systematised other aspects of well-being, but did not detail the contribution of nature. Adding such detail could be informed by recent work in disaggregating both ES and beneficiaries ( Cimon-Morin et al. 2015, Daw et al. 2011, Horcea-Milcu et al. 2016 ), which has stemmed from the need to link ES to the well-being of diverse beneficiaries. Further, measuring the range of contributions of nature to well-being in a multi-cultural context would benefit from including social scientists in national ecosystem accounting framework development. Suggestion 2: A systematic classification of ecosystem processes would help disentangle the links amongst ecosystem processes, ES and well-being (Criteria 1b and 1c). This addresses the Fisher et al. (2009) argument that an ES classification should both (a) include intermediate ES (ecosystem processes) and (b) link to beneficiaries. FEGS-CS ( Landers and Nahlik 2013 ) addressed the second requirement. CICES (2013) included regulating and maintenance ES, but did not link these systematically to beneficiaries or well-being. Ambiguity is created by the fact that clean water may be considered a final ES for human consumption, but also an intermediate ES for fish habitat and recreation. A more comprehensive classification of products of nature that directly or indirectly, positively or negatively, influence current and future well-being would include any ecosystem process or ES that can be demonstrably linked to well-being. A more systematic classification of ecosystem processes, linked to ES, could be built upon conceptual relationships ( de Groot et al. 2002 ), expert consensus ( Kandziora et al. 2012, Maynard et al. 2010 ), research on local ecological production functions ( Barbier et al. 2011, Daily et al. 2009 ) and process analysis linking ecosystem processes with their potential to provide ES ( Spangenberg et al. 2014 ). Existing multi-purpose statistical classifications such as the Central Product Classification (CPC) ( United Nations Statistics Division 2015a ) could inspire a future ecosystem process/ES classification. The CPC includes both intermediate and final goods and services. Products are linked to expenditure categories for different purposes by sector (government, households, non-profit institutions, producers). Similarly, an ecosystem process or ES may serve different purposes for different beneficiaries in different contexts. Suggestion 3: A detailed classification of ecosystems would help systematise the measurement of linkages amongst ecosystem structures, processes and ES (Criterion 1b). Much work on spatially mapping ES is based on land cover data derived from satellite imagery. Land cover classifications are often coarse and do not readily identify ecosystem types, such as wetlands, that are important for the supply of ES. Several ecosystem and land cover classifications are in common usage, however, there is no generally-accepted international classification. A global ecosystem classification would need to be sufficiently detailed to correspond to national classifications, be based on ecological principles and take into account properties beyond dominant surface vegetation by including vegetation strata, soil type and water depth ( Bordt 2015a ). Important work that could contribute to this is the USGS/ESRI mapping of global ecological land units ( Sayre et al. 2014 ) and ecological marine units ( Sayre et al. 2017 ) and crosswalks linking land cover classes with habitat types ( Erhard and Olah 2014, Kosmidou et al. 2014 ). Such work could contribute to the delineation of Service Providing Units ( Luck et al. 2009 ) in terms of habitats and species ranges. Comprehensive classifications of ES and ecosystems would further encourage the development and comprehensive compilation of ecological production functions that link ecosystem structure, composition and processes with ES. Suggestion 4: Standard aggregates, developed in collaboration with policy analysts, would help ensure that the information is applied in national planning (Criteria 6b and 6c). Monetary aggregates may be convenient for raising awareness of the importance of ecosystems, but are not sufficient for making decisions on their optimal management. For some non-market services such as species habitat, it is still debatable whether they can be valued in a meaningful way using monetary indicators ( Nijkamp et al. 2008, Christie et al. 2012 ). “Dashboards” that combine monetary with non-monetary ecological and social impacts of these decisions would provide a richer basis for trade-offs in deliberations on policy options. Suggestion 5: Incorporating a long time-frame would help focus measurement activity on illuminating the future implications of current decisions taking into account different world views (Criterion 8). Current options for ecosystem management may change ecosystem properties that reduce the future capacity of ecosystem to provide critical services ( Sumarga et al. 2016 ). In terms of regulating services, this may lead to serious environmental disasters. Scenario approaches supported by improved predictive ecological models, combined with a trade-offs analysis would provide better insights into policy options than are currently available. Suggestion 6: Harmonising ES models with respect to data requirements, classifications and outputs would support the incorporation of long time frames (Criteria 5c and 8). Collaboration amongst the ecological modelling community would facilitate focusing the best concepts of current models along the ES cascade together with standardised concepts and classifications to ensure their interoperability. Suggestion 7: Treating uncertainty in measurement throughout the statistical “value chain” would help ensure that our ignorance of many ecological processes is made explicit (Criterion 10a). Statistical methods exist for assessing measurement error. Smith et al. (2011) , however, observed that established methods are insufficiently applied, especially in the treatment of spatial information. Particular attention should also be paid to potential error propagation, since much spatial data are actually derived from a combined series of spatial inputs with different levels of uncertainty. Making the uncertainty of information used to support decisions more explicit would focus attention on reducing that uncertainty. It would also encourage the use of methods that are more cognisant of social preference in decisions. Stirling (2010) noted that methods such as multi-criteria mapping and the Q-Method are often used to reveal the diversity of these preferences. Suggestion 8: Engaging multiple disciplines and sectors in adaptive and ongoing development and implementation of national ecosystem accounting would promote convergence on measurement, policy directions and aggregate indicators (Criteria 3b and 4b). A comprehensive stakeholder group would include environmental and social scientists, economists, policy experts, statisticians, civil society, business and decision-makers. A better understanding of the issues of agreement and disagreement amongst these stakeholders would promote convergence on accepted measures and eventually on policy directions and standard aggregates used to monitor and report on them. This would support the objectives suggested by Carpenter et al. (2006) for management that is adaptive to new knowledge and changing conditions. For example, focusing on the reversibility of effects and flexibility of commitments ( Stirling 2010 ) amongst a diverse group of stakeholders would support the development of optimal policy options rather than simply evaluating the outcomes of one option. This is in keeping with the objectives of Strategic Environmental Assessment ( Partidario and Gomes 2013 ). Suggestion 9: Recognising the designation of CNC as a subjective, political and iterative process would support setting aside elements of nature that are considered by some stakeholders as essential to protect (Criterion 7). Identifying an element of nature as “critical” could be initially incorporated into an ES measurement and assessment process by attributing social values to it. This is one aspect of “importance”. Narrative and deliberative approaches ( Chan et al. 2012, Smith et al. 2011 ) may be sufficient to protect a species or ecosystem from being traded-off for its instrumental value. However, to make the case for its ecological and economic importance, further information would be required on how this element contributes to ecological integrity and well-being, as well as on the long-term threats to its functioning. Providing this information would benefit from progress on the conceptual and measurement developments suggested above. This review is necessarily limited to a selected set of frameworks. It is likely that some criteria are addressed in the broader literature. Further, the assessments and suggestions have required substantial expert judgement on the part of the authors, the most important being the interpretation of how a specific criterion can be applied to national ecosystem accounting. This is based on the authors’ judgements of what national ecosystem accounting can and should be. Furthermore, we recogise that this is an active area of research and these frameworks are being applied and revised and new ideas are constantly being tested. The suggestions are not intended for related fields such as ecosystem services, land use planning and conservation, amongst others. Nonetheless, there are opportunities for these fields to contribute substantially to future national ecosystem accounting frameworks. While the 16 frameworks reviewed incorporate many strengths, none fully addresses all the criteria of a comprehensive national ecosystem accounting framework. Collectively, they provide insufficient guidance on ecosystem classifications, measurement in general, delineating Critical Natural Capital, incorporating broad human values and measuring statistical uncertainty. Making progress on the nine suggestions for conceptual, measurement and process development would broaden the appeal, utility and wide application of future related frameworks. We do not claim that this review is comprehensive, since there are active debates on the scientific validity of the ES concept ( Schröter et al. 2014, Luck et al. 2012 ) and the challenges of incorporating diverse world views ( Borie and Hulme 2015 ). The objective, however, is not proving the importance of ecosystems to human well-being, but facilitating a constructive dialogue amongst scientists, affected communities and decision-makers on national ecosystem accounting frameworks to achieve common objectives. The first author (MB) would like to thank the World Bank, United Nations Statistics Division, The Government of Canada and the Québec Centre for Biodiversity Sciences (QCBS) Working Group 14 for providing opportunities to be engaged in the growing community of practice of ecosystem accounting. He is also indebted to his PhD Examination Committee (Konrad Gajewski, Anthony Heyes, Jackie Dawson, Kai ML Chan) and Elham Sumarga for many constructive comments on earlier drafts of this paper. Developing conceptual framework for ecosystem mapping.
. https://www.ipbes.net/glossary/units-analysis. Accessed on: 2018-9-29. Determining the value of multiple ecosystem services in terms of community wellbeing: Who should be the valuing agent? System of Environmental-Economic Accounting 2012 - Experimental Ecosystem Accounting. Central Product Classification (CPC) Version 2.1.
. https://seea.un.org/ecosystem-accounting. Accessed on: 2018-9-29. We distinguish national ecosystem accounting as an approach that is specifically developed to be applied at the national level. The detailed assessment table is presented in Suppl. material 1 . In earlier literature (e.g. de Groot et al. 2002, MA 2005, Kremen and Ostfeld 2005 the term “ecosystem functions” was commonly used to describe the processes undertaken by ecosystems. More recent literature has tended to use the term “ecosystem processes” (e.g. Díaz et al. 2015 ) or “ecological processes” (e.g. Rounsevell et al. 2010 ). This paper consistently uses the term “ecosystem processes” regardless of the nomenclature of the source material. We believe this terminology helps distinguish ecosystem processes from the more general “function” of ecosystems to provide ES and also from “ecological production functions”, which are mathematical constructs. “Optimally, the community should be included in open dialog [sic] early in the framework development process to identify, classify, value, and/or quantify ecosystem services.” This is consistent with the approach suggested by Ash et al. (2010) .